I should say at the outset that I was dubious of the claims made in the marketing materials promoting the Beautyrest Sleeptracker. I simply didn't see how one device could effectively and accurately monitor two sleeping individuals simultaneously without getting signals crossed. I also found it unlikely that the Beautyrest Sleeptracker could accurately gauge the breathing and heart rate through a 10-inch mattress. But on both counts, I was more than pleasantly surprised. Within acceptable limits, this sleep monitor seems to deliver on most of its promises. Does this mean this personal sleep analyzer was perfect? Certainly not. As with nearly all consumer sleep trackers, the monitor's accuracy was hampered some by technological limitations. But on the whole, I am impressed. Let's take a look at the Beautyrest Sleeptracker more closely. How Intelligent is the Artificial Intelligence? Final Verdict: Does It Live Up to the Hype? The Beautyrest Sleeptracker monitor was developed by Fullpower Technologies and licensed to Serta Simmons Bedding, the company that manufactures the Beautyrest line of mattresses. I mention this because users are, understandably, more likely to trust a piece of high technology developed by a technology company than one developed by a mattress firm. The Beautyrest Sleeptracker is entirely non-wearable, which means it doesn't require you to slip on a wristband, headband, ring or wear any other piece of technology. This is a boon to anyone that has a tough time sleeping while wearing these sorts of devices or for those interested in a “set it and forget it” experience. It was this feature that really impressed me. The Beautyrest Sleeptracker is powered on at all times and will sense when you get in bed and begin breathing in a manner that it interprets as sleep. At that moment it automatically begins recording. There's nothing you need to do. No devices to slip on, no apps to run and no buttons to push. This makes it far more likely that you'll record your sleep data consistently, and consistent data is the bedrock of a useful sleep tracker. The Sleeptracker claims to use artificial intelligence (AI) to analyse your sleep data and give you actionable steps to improve your nightly sleep score. I'm still dubious of this, as I'll detail later, but I don't think, in the end, this is as much of a problem as you might think. As an added benefit you can interface your Beautyrest Sleeptracker with your Amazon Alexa-enabled network allowing simply voice access to your nightly sleep reports. Users that are loathe to pour through on-screen graphs and numbers find this feature very useful. Best Sleep Tracker Reviews (2019) - Which Sleep Monitor Should You Get? In the box, you'll find two padded sensor arrays and the main processing unit which unites the two sensor clusters, crunches the data the sensors are recording and transmits it (confidentially) for processing by the AI as mentioned earlier. The processor unit communicates all of its findings via WiFi to your cell phone. Set up takes some time but is, for the most part, fairly easy. You place the sensors directly under your pillows, sandwiched between the box spring and your mattress. A cable lead from each gets plugged into the main processing box which is then plugged into the wall. Since the Sleeptracker communicates via WiFi, there's no need to have the monitor visible. Placing it under your bed, or anywhere out of sight is perfectly acceptable. The Sleeptracker app has been tested with Simmons Beautyrest and Serta mattresses, but it works with any standard mattress. After you download the free Beautyrest sleeptracker app, it guides you through a mostly painless registration and pairing process, and then you're all set. From that point forward the Beautyrest Sleeptracker will record your sleep sessions without any further input from you. You don't need to have the app running on your phone. You don't even need your phone to be in the same room. The only downside is that you won't be able to use the smart alarm function when your phone is off. I give the Sleeptracker high marks for ease of use and consistent recording. It honestly doesn't get much simpler than this. The Beautyrest Sleeptracker monitors and records your respiration rate, heart rate, wakefulness and movement, and sleep depth. Your sleep depth is divided into three levels, light sleep, REM sleep, and deep sleep. Each of these levels of sleep is tracked individually and displayed in your sleep totals. Overall I find the amount of the data that this sleep cycle monitor tracks to be thorough and on par with other trackers I've looked at. I like how your nightly sleep report tells you not only the total amount of sleep you got that night but also how that total breaks down into the aforementioned categories. Along with your sleep totals the Sleeptracker displays a running graph of your heart and respiration rates throughout the night and a matching bar chart that displays your sleep depth from moment to moment as well as any wakeful periods you experienced. I find this linked graphical display of all the recorded data an effective way of sharing the information. It makes it easy to scan for patterns from night to night. In the morning the AI engine analyzes all of the information it collected throughout the night and generates a final sleep score, a number between 0 and 100, that the company insists is an accurate representation of the quality of that night's sleep. 100 is a perfect score, and I assume that a score of 0 means you didn't get a wink of sleep that night because you were being actively mauled by tigers. Fullpower says that a score between 80 and 100 is considered a good night's sleep. If you fall below this threshold, you'll definitely be looking to improve your sleep, and measuring your baseline is a good way to start. Overall the quality and quantity of data collected are good. Of course, we always have to temper these reviews by mentioning that there's no good way to confirm the accuracy of the data collected. Without hooking yourself to proper polysomnography equipment, the highly-invasive hive of wires and sensors that health professionals use to identify sleep apnea and other serious sleep conditions, you couldn't confirm, for example, whether you were actually in REM sleep when the Sleeptracker device says you were, or that your heart rate was what the sleep monitor reported. But perfect accuracy may not matter. With sleep tracking devices like this one, we're really interested more in general trends, not exact or perfect measurements. Certainly, the device has other issues as well. Users often report the tracker logging them as lightly sleeping when they were, in fact, reading in bed. This class of tracker works on a system of educated guesstimation. It gets things wrong sometimes. But what's important is that it's more or less consistent. Because as long as the sleep monitor gets things wrong in the same way all the time, then you can still spot general trends in your sleep that can be very useful for improving it. Honestly, this is the one marketing claim that doesn't really materialize as promised. This isn't a deal breaker for me though, partially for the reasons I just detailed in the previous paragraph, but also because I didn't go into this review with particularly high expectations. In most of the advertising for the Beautyrest Sleeptracker, the consumer is promised real, specific, actionable steps, based on the data recorded, that they can use to improve their sleep. In theory, these insights are fed by the questionnaire you fill out after each night's session, where you're asked lifestyle questions about your behaviors before bed. The AI analyzes your answers, the quality of that night's sleep, on its own and compared to previous sleep sessions, and compares you to thousands of other people that share your basic characteristics. This should, in theory, allow for a robust analysis of sleep trends. I say, “in theory” because you don't have to fill out this questionnaire, you aren't reminded to, and it's very easy to forget to do it at all. Some users are good about answering the questions, but others often forget or don't take the time. And it's unclear whether filling out the questions make much of a difference in the advice you're given. Whether you complete these questions regularly or not the Sleeptracker's personalized Sleep Coach and Community insights suggest things you can try to help improve your sleep. As an example, you might be told to try and avoid caffeine after a certain time each night. Or maybe to use your smartphone in bed less. From what I've seen the recommendations don't vary appreciably, whether you complete the questionnaires regularly or not and, for the most part, represent common sense suggestions that you don't need a bunch of sleep data to tell you. It's not terribly impressive. But again, I recognize the limits of the technology. These sleep pattern trackers make educated guesses based on inferences. You simply can't expect, and won't get, perfection. But if the much vaunted AI sleep coaching were worth its salt, it certainly should be able to give suggestions of a higher caliber and great specificity to people that regularly answer their questions than to those that don't. The fact that it doesn't, or at least not frequently enough, calls into question the value of the AI. You may simply have to give it a try yourself and see what you think. The Sleeptracker app comes with a sleep cycle alarm. You set a time range for the alarm, and the smart alarm system wakes you up when you are in a light sleep phase, which helps you to feel more refreshed in the morning. The Beautyrest Sleeptracker has an MSRP of $199, but you won't ever actually pay that much, and that's good because I couldn't recommend it for that price. Right now online stores are carrying it for $119, and it's known to go on sale for $99. Based on my experience I think either of those price points is a good fit for the value the Sleeptracker brings. Overall I think this is a well made, quality bit of hardware and software. The sensors are solid and should last quite a while. The processing unit runs cool so you shouldn't have any overheating issues to worry about. The data collected seems to be of a caliber at least on par with, if not better than the competition. It's certainly possible to get more accurate results with wearable sleep trackers, but those aren't an option for many people. And the minor drop in accuracy found in the Beautyrest Sleeptracker is more than offset by the consistent collection the always on, automatic recording feature affords the user. Good data collected consistently is more valuable than excellent data collected occasionally. Whether the AI analysis is of much value to the end user isn't settled for me. 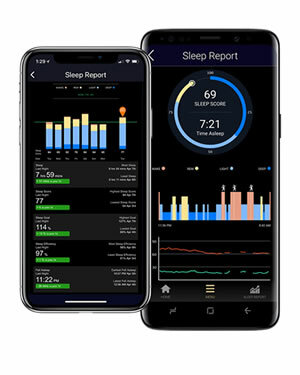 It's a necessary step for the sleep monitor to deliver the reports it does, as it is the process that takes general measures like heart and respiration rates, and movement levels and converts these to definitive statements about things it isn't directly measuring, like what your sleep depth is at any given moment. That these guesses seem to be reasonably accurate is a point in the AI's favor. However, because the promised “actionable steps” never really materialize in a meaningful way I'm loathe to say that the AI is providing any useful, personalized advice. I'd say it does a good job of crunching numbers but a poor job of making those numbers actionable. But if you're just interested in monitoring your sleep cycles and aren't expecting your monitor to fix all your issues for you, then I think you'll be pleased with this device. I was also impressed by the devices ability to accurately distinguish two people's sleep data and keep them from contaminating each other. In the end, if you're looking for a non-wearable sleep tracker that does an excellent job of recording your sleep data on a consistent basis and provides an easy to use well-organized app interface, then you can't really go wrong with the Beautyrest Sleeptracker. Particularly if you're part of a track-happy pair. It's one of the few products on the market made specifically for two sleepers. At $119 I feel confident recommending this sleep monitor to just about anyone. If you can pick it up on sale for less, don't hesitate. As long as you meter your expectations, you're sure to be happy with your purchase. If you are a mobile person and want to carry your sleep tracker with yourself, I would recommend to check out one of the non-wearable sleep trackers, like Withings Sleep or Emfit QS.